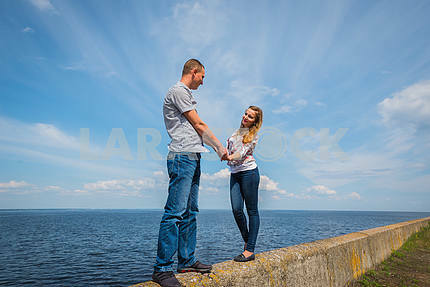 A couple in love - embracing, together, holding with the hands, near the water on a sunny day, blue sky with long white clouds on the background. men and women are looking into their future, smiling. Description A couple in love - embracing, together, holding with the hands, near the water on a sunny day, blue sky with long white clouds on the background. men and women are looking into their future, smiling.